Left column: Clearly visible artifacts in so called blip-up and blip-down images. Upper right: Corrected blip-down image. 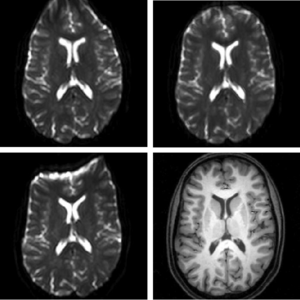 Bottom right: Corresponding T1-weighted MR. The aim of this project is to test a new approach for susceptibility artifact correction in echo planar imaging (EPI). Modeling the EPI-typical deformations along the phase encoding gradient together with mass preserving registration techniques is in focus of this project.